Every year at work, there’s a Halloween competition on who has the best door decoration. 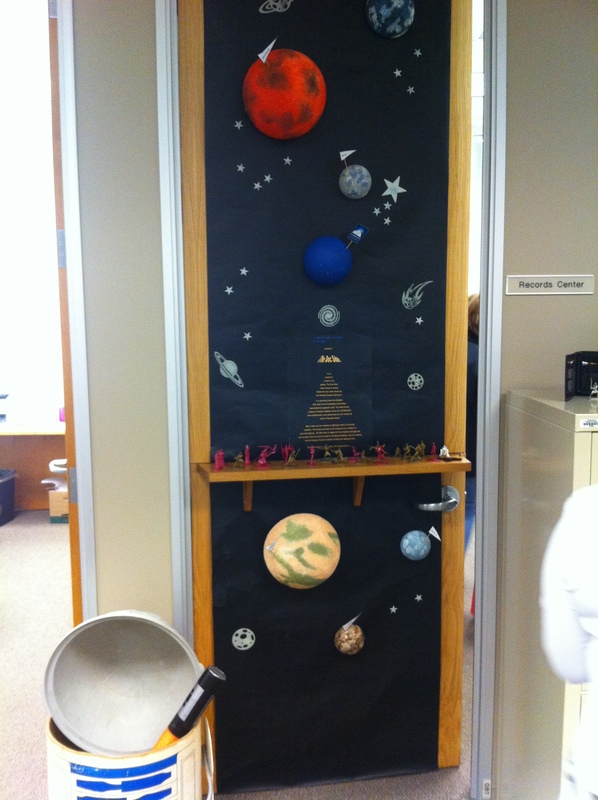 Each department is responsible to decorate their manager’s door however they want. 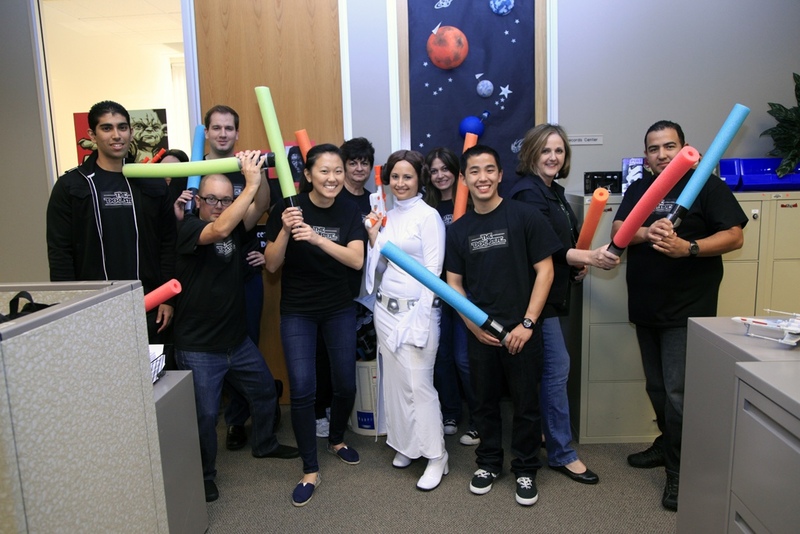 This year, my department decided to do a Star Wars theme. On the day of Halloween, employees are allowed to bring their kids to trick-or-treat. Rather than doing the usual of giving out just candies, we wanted to give them also light sabers just like the ones from Star Wars. We weren’t going to go to Disneyland to purchase them, but make them! Thanks to Pinterest, Google and creative bloggers, we were able to make light sabers right at home. 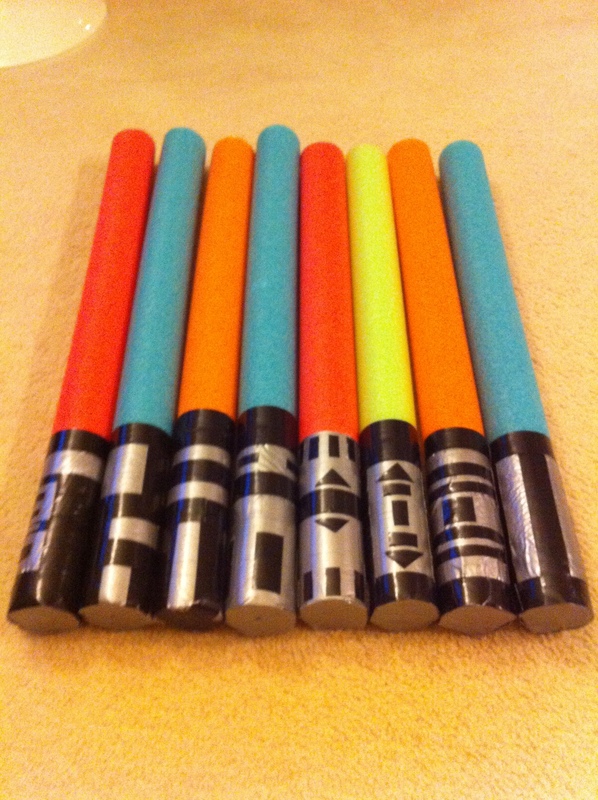 All we needed to make light sabers were: pool noodles, gray and black duct tape, serrated knife, and scissors. It’s easy and fun to make these light sabers. Surprisingly, it takes a bit of time to make them because it was challenging at times to work with the duct tape. Those duct tapes were strong. My favorite light saber is the third to last one. I think the buttons look cool even if that’s not how the real Star Wars light saber is like. With black butcher paper, painted styrofoam planets, and some glow in the dark stars, we created a galaxy like that of Star Wars. On the ledge were little Star Wars figurines from a board game. Kat, my co-worker (I did the mud-run with her), dressed up as Princess Leia! She won 2nd place for her costume! Congratulations Kat! 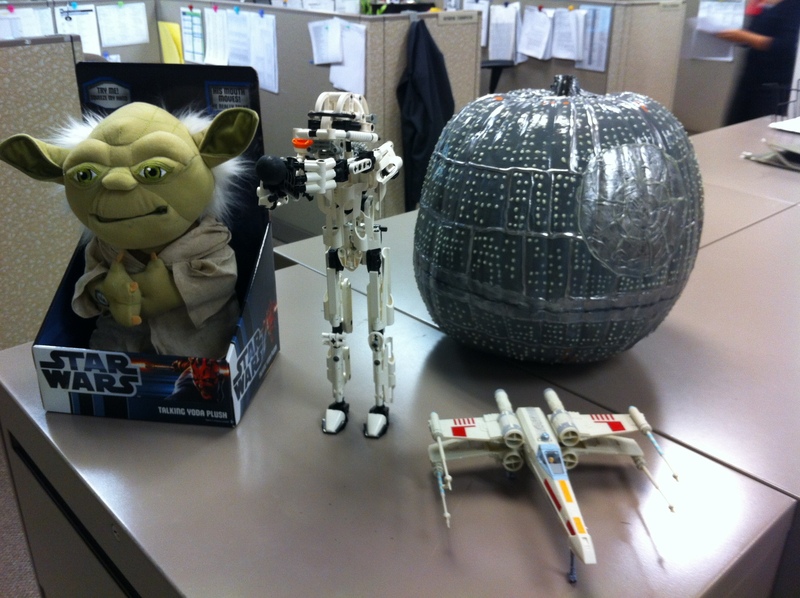 We had some Star Wars toys that we laid out on top of some filing cabinets for decoration. My favorite part about the decor in the image below is the Death Star pumpkin! Kat aka Princess Leia made this all on her own. She used glow in the dark paint and puffy paint to make the Death Star pumpkin. Too bad we weren’t able to see if it really glowed in the dark because we were at work. But hey, as long as it looked good it what mattered the most. Good job, Kat! As a whole department, we wore a t-shirt that said in Star Wars font: The Doc Side. I’m not sure who came up with the name, but it was pretty clever since our department works with a lot of records and documents. Kat, my co-worker (I did the mud-run with her), dressed up as Princess Leia! She won 2nd place for her costume! Congratulations Kat! Hope everyone became sweeter with all the candies they munched on!